In November of 2009, I performed a solo show at The Stone in New York City. The next day, I sat down with Molly Sheridan on Counterstream Radio for New Music USA. We talked about my current album at the time, Silent City (2009), about performing live, and about performing sound archives. To listen to the full interview, click here. MS: How did you end up doing this kind of work? BH: Well, two things led me to this place. 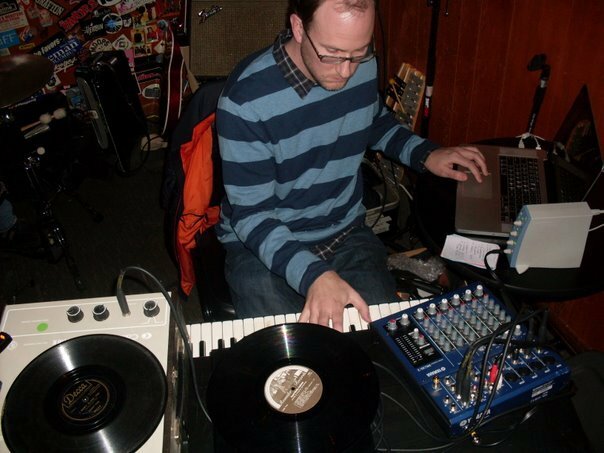 First, I have been inspired by musicians like Christian Marclay and Philip Jeck and their use of old turntables, but whenever I tried to incorporate turntables into my own live performance, I started to sound like bad versions of them. So, over the years I gradually took elements from them and other places and made them my own. The old Rhodes, plus the old record players and the old recordings all seem to fit really well together, and I filtered some new, experimental ideas through these older things, older media. And then vice versa: I take the older ideas and put them through new technology. It’s the balance between old and new that I am really interested in. The second thing is because I’ve been working so much in archives, my idea was to try to bring them out into a live performance. So, literally taking them out––I mean, I can’t take the records, or cassette tapes or whatever out of the archives, but I can take representations of them––and then sharing them and working with them in a live context. BH: Right. I had vinyl pressed for myself, so just one-off LPs and 78s with my own material on it, or things that I recorded and put onto the older medium. That’s the whole idea, because when I was at Berea College in their Archives, it was like a 9-5 job in their basement [laughs], and I wanted to get out into the sunlight, outside...so taking those recordings out of the basement was a very liberating thing for me. MS: Can you talk a little bit about how you ended up there and what you were after when you signed up to the the “9-5 job” in the archives? BH: Sure. I had been working with all kinds of folk music as source material for a number of years before that. But this was the first experience for me (this was in 2006) to get close to the people that were making the “material”, or at least their relatives. That added an entire new dynamic. Before, the world of sampling is such that you can take whatever you want from anywhere, and that’s part of its excitement. My experience in Kentucky added another layer to it, because I felt somehow responsible for the material and I felt I needed to give a certain amount of respect to the people that I was borrowing it from. The relationship with a place, and with a people in that place over a long period of time is what I have been gladly working on and fostering. BH: Yes, the whole allure for me was that the people weren’t used to being in front of a microphone, necessarily. So, when they were being recorded there was an awkwardness that I fell in love with. The more I listened, day after day, I heard a lot of these kinds of moments. And, I found that in most commercial recordings––obviously––that’s the part that always gets cut out. These in-between moments were really magical for me. They show a human side, they show vulnerability: there are parts where people are spitting or cackling out a really strong laugh, and it just makes a recording (which is not a very human thing) a much more touching and, well, human thing. I felt that I was in the room with the people recorded, even though it might have taken place twenty or forty years ago, or more. MS: What are you thinking about and strategizing when you are adding your own musical sounds over top of these recordings? BH: I’ve been really conscious about not squaring it off and turning it into a 4/4 beat, or making the archival recording fit into some kind of square peg that I have created. My idea has been to create a music that ‘co-habitates’ (to borrow a phrase from Clive Bell) with the samples. I wanted to leave the archival recordings alone and then make a simultaneous music that was complimentary, or provide a landscape or sound bed for the other recordings to float on top of or in reaction to the recordings. You can listen to them together as one thing, or you can separate them in your mind. For me, it was a way to navigate through a lot of the material without overly manipulating it. MS: I, too, was used to getting these stereotypes as I moved around in urban areas. But, what attracts you to this sound world? Is there some connection historically as part of your family, or is it part of your own intellectual curiosity? BH: There is a connection and it’s something that I ignored for a lot of my life. The whole Silent City album is about a fictionalized town in Ohio, which is really about the town where my dad grew up and all of his family. It’s South-Eastern Ohio, basically in Appalachia, and is about the memories that I had as a kid visiting there. My family is not necessarily a very musical family, but I brought in a lot of my own influences and projected them on a semi-imaginary place....Also, all through college I studied classical music and composition, and really enjoyed it, but there was always an element that wasn’t my own. It wasn’t until after I finished school and came back home––I kept trying to write like I did in college, but that wasn’t working––it wasn’t until I just started to pay attention to the things right in front of me: in my room, or in the landscape around me or the people around me that the music became a lot better. It became a lot more personal, and it also became my own. It’s a matter of paying attention to what’s around me, that is so important. BH: Well, first of all, there’s so much information out there, and to find a way to navigate through it is really important. Also, the story for me doesn’t have to be the story for you. The intention was to leave a certain amount of ambiguity in the pieces. Personally, it is about my father’s hometown, but you don’t have to know that; then it becomes more mythologized––you can tap into it, but you do not have to know the exact place. I think the folk songs, and the material that I used does that as well. They are about specific things, but the beauty of them is that you can bring your own experiences to them, and it can be different for every listener. 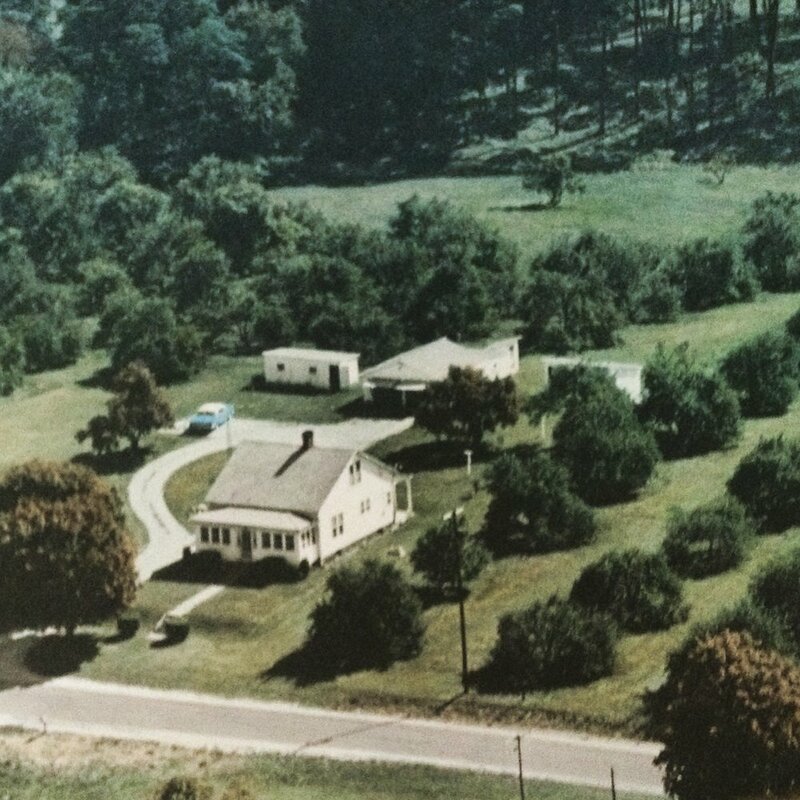 Harnetty's grandparent's home and apple orchard, Junction City, Ohio. They referred to the cemetery across the street as "Silent City." MS:---some very specific ways of dealing with the work of others. Do you ever get any push back, or do you ever worry over anything like that? BH: It’s definitely an issue that is present all of the time, but I’m not necessarily interested in doing a Girl Talk or John Oswald thing, where it’s part of your aesthetic to push the ethical boundaries. Personally, the whole idea of going to Berea and going back over a number of years was one way for me to become comfortable with using this material, and also have a set of circular mutual respect going on....I don’t think I’ll ever fully answer that question. However long music has been made, people have always borrowed or stolen music from one another, and I think that’s a normal part of the process of making music. On the other hand, I think it’s really interesting to develop a relationship over a long period of time, because it gives you an insight, and a conversation that is deeper than a surface interaction. MS: And did I read somewhere that you actually did share this music with some of the relatives of the people that appear on it? How did that end up happening? BH: Yes, that’s true. Well, there is one singer in particular, whose name is Addie Graham, and she’s the one that sings on that first track of American Winter (those recordings were made in the 1970s), and her grandson is Rich Kirby, who is actually a really well known traditional musician in Kentucky. I had the opportunity to go back down and present these pieces to him [laughs] and to other people in the community, and that was one of the most nerve-racking experiences ever [laughs again]. But, he was great: he understood that I wasn’t trying to manipulate the music, and that there was a certain amount of respect. I don’t know if he liked it necessarily, but he was okay with it, and most importantly, we were able to talk about it. MS: As I listened to American Winter, but even more so with Silent City, I thought, “Is this an album or is this a track”? That is a big thing that comes out of the music industry, with downloading and cherry picking, because you knew going in that you could interpret this as a fictional story. Or, there’s obviously a lot of clues that Silent City could be a story line, or narrative: how does it work for you? Does it need to be listened to from start to finish? BH: Ideally, that the way it is to be heard. And, I understand the whole world of the iPod and the “shuffle” function, and that’s great, but in this case I like the idea of creating a space to sink into. I don’t think it works very well if you just catch a few fragments (because it’s not the fastest moving thing) and it takes time to dive into that world. It’s more like a novel, or a series of short stories, instead of a quick fragment. MS: ....but, we are going to listen to two full tracks to give you a sense of how these pieces slip into one another. This is “Sinclair Serenade”, followed by “Sleeping in the Driveway”. MS: Now if you are listening out there and you think you recognize that voice, you are probably right. That was Will Oldham, and he seems like a perfect fit for this project. I know that it resonated for you as well; how did Will Oldham end up on your disk? BH: Well, sure, he’s from Kentucky; that’s the most obvious thing. But, I really liked his voice––the more that I listened to the archival material, I started to hear remnants of his voice in it––the breaks in the voice, the time where it might be a little out of tune, the roughness of it, the rawness of it. And that very much appealed to me. I liked working with the archival material, but I also wanted to get away from the sample in some respects, and take what I had learned from the archives and then reapply them compositionally in the pieces. We were both artists-in-residence in a place in California called the Headlands Center for the Arts––I was there a few years ago and he was there last year––so, I contacted him and went out and spent a week there last year, and we did the recordings there. As far as the process is concerned, I was interested in taking the folk material and breaking it apart, fragmenting it on my own, and then reassembling it. With the lyrics, for example, I came up with a list of fragments from folk songs that I really liked––little, short phrases––and then I had my own list, inspired by memories of my father’s home town, and then Will contributed a third list. The process of working through the lists––almost in real time, it felt like––was like a game, a compositional game. Will took elements from each of the lists, and put them together. It’s not that different from cutting and splicing the samples themselves. So, he’s actually taking a kind of William S. Burroughs cut-up approach, and applying it to the lyrics. That’s what happened to the music, as well. I would transcribe folk tunes, which may not even be on the final recordings, and pull out certain elements and use them as a basis for each new piece, or as an interlude between pieces. In American Winter, the folk material was so rich and wonderful and new to me, so I placed it at the forefront. This time, with Silent City, it gets subverted in some ways, and put in different places. I’m consciously thinking about how the samples can work their way into each piece, directly or indirectly, and the aspect of Will’s contribution gave it a much more live, collaborative element. BH: That’s exactly right. And, his voice is really appealing. It is somehow really strong and vulnerable at the same time, and it flows in a really nice way. MS: You mentioned that you shifted the focus of how you use the samples. Did that change what you went looking for samples? What worked well in this new scenario? BH: Yes. With American Winter there were many samples that I could not use. Everything became too crowded, and these were mostly instrumental parts. And with Silent City, I was able to incorporate these instrumental parts in ways that I couldn’t before. MS: I’m curious how this fits into your other work. You’ve done a lot of stuff; it’s all beautifully showcased on your website, and I was listening around to that stuff and I thought, “this is so interesting; this is so different!” But, as I looked at it again I realized that maybe it is not that far afield. How does this work fit together in your life and in your head, for people that are just coming to you through this material? BH: I suppose there is a thread throughout. I’ve been doing a lot of installation work and sound art pieces as well, and for me I’m really interested in the idea of layering, of layers that are independent from one another. This comes in part from the people that I studied with––primarily Michael Finnissy over in the UK. It is an idea that we talked about often, and he does a lot in his own music. Again, it is the process of trying to make an idea my own, over the years, that has led me to this place. I like several layers of independent music on top of one another. You can hear it as one thing, or you can hear it as its individual parts. And to me, these two albums are an extension of this very idea. They are using folk songs directly, but in ways that are not traditional, applying experimental ideas to the folk material. The other pieces throughout the years also have the same elements. The other aspect that I keep working with is this love of all things documentary, which includes the field recordings, or going out and making my own recordings. But, oddly enough, this is combined with a love for counterpoint. In general, these things don’t work well together, so I‘ve been trying to find ways to combine those two very disparate worlds between counterpoint and documentary. Because documentary is not controlled very much, and it’s random in a way, I guess it’s a really, really loose counterpoint that I’m interested in. MS: As I was reading through the reviews of this last album, and there was one––I think from a European publication––that said, “if you pressed pause, you would have a postcard.” And as you read through each reaction, the people writing about this album began to fetishize....It connected with people and they would write these poetic...I mean, it really inspired them emotionally....Is that dangerous to you, is it making a false nostalgia? BH: I’m not really all that interested in nostalgia. I think that their reaction comes from a couple of different places. Whenever you are dealing with any old material, people are going to put their own memories on it. Personally, I don’t want to be there. I like the idea of showing many layers of history––it’s back to the ‘layers’ idea [laughs]. Something that has that amount of history to it already has several different meanings present. When any given listener comes to it, they bring their own baggage and their own interests that they project on to it. I can’t control that. So, I like to present the material and then try to get out of the way as much as possible. This is where ambiguity comes in to play, to let that be okay, to let people come up with their own interpretations of what is going on, and I am not trying to dictate that or control it too much. MS: Well, speaking of letting go of control, I want to play one more track before we wrap up, but I couldn’t decide which one. I’m going to let you pick between “Some Glad Day” and “It’s Different Now”---So, if you want to pick out one of those tracks and tell a bit about it, and then we’ll give it a listen.